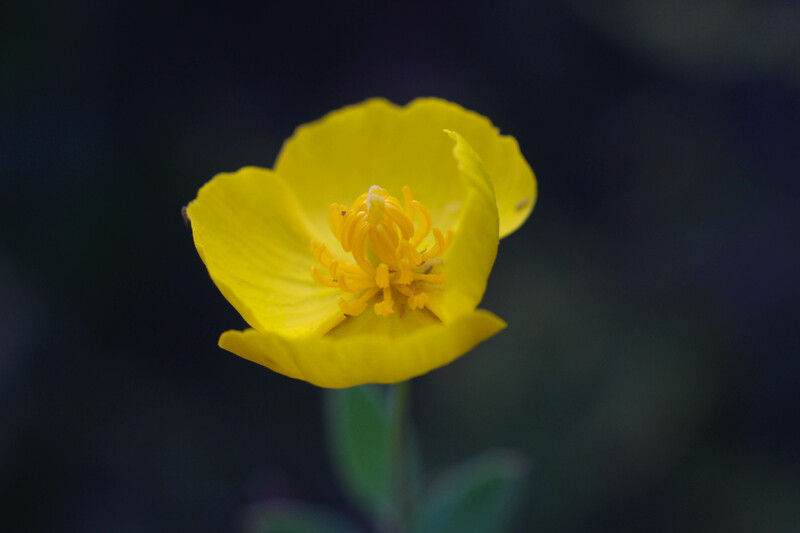 Bush poppy was a stunning sight in a fog-soaked hike atop Mt. Tamalpais today. The brilliant yellow flowers adorn the chaparral like jewels. Each blossom can be a few inches across, with four delicate petals surrounding a slightly orange mound of stamens. The leathery, gray-green leaves also are attractive. Bush poppy (Dendromecon rigida, also known as tree poppy) can grow up to nine feet tall, though all the ones I have seen have been much smaller. You can find it in coastal chaparral, and also in the foothills of the coast ranges and the Sierras up to 6,000 feet. It thrives in well-drained, rocky soil; I saw it along the red-dirt cut banks of the Rock Spring trail on the east side of the mountain. The photo above, which only shows the blossom, doesn’t do this plant justice–it really is a striking shrub, especially as a splash of color in the muted tones of the chaparral.